Dingle Astronomy: First ACP auto run - I went to bed! As it is now light until close to 11pm local time I have been pushing to try to fully automate the imaging so I can GO TO BED! 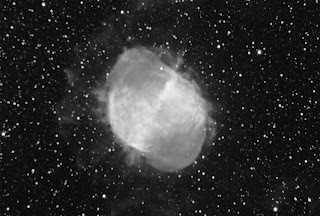 Last night I decided to run a fully automated sequence using ACP including duskflats and 2 hours each on M57 and M27. (It's getting light at about 3.30am BST so there's only about 4 hours of imaging time available per night at this time of the year). The M57 data failed - ACP failed to track a guide star. The M27 data however was usable and the image above is the result - you can clearly see the gas clouds stretching far beyond the main nebula. There is clearly a focus/collimation/alignment issue in the system somewhere though as the left side of the image is clearly out of focus yet the right is fine - more investigation needed!